Bankruptcy is a tool used to help eliminate troublesome debt, however, what happens if you are on the creditor side it can be distressing. While many individuals do not ever believe this will happen to them, it happens quite often every day when individuals pay a large down payment to a general contractor for work on their house. When a general contractor files for bankruptcy before finishing work on your property, you can very often get left holding the bag. While even when entering into a house repair or improvement contract, contractors can run into money issues. When this happens and the contractor files for bankruptcy protection, homeowners receive a notice to creditors of the pending bankruptcy case and are left with no immediate avenues to secure any down deposit or monies already paid to the contractor. While it may be impossible to isolate yourself from general contractors filing for bankruptcy completely, there are three ways to avoid losing more substantial amounts. These include doing your due diligence on the contractor you decide to hire, ensure you have a contract established, and pay only the smallest down payment that you can negotiate. General Contractors come in all shapes in sizes, from the young, enthusiastic novice to the battle-hardened, long time contracting veteran. Choosing the right one can not only ensure that the job gets done on-time and to code, but can also decrease the risk of you losing your down payment because of a Chapter 7 bankruptcy. 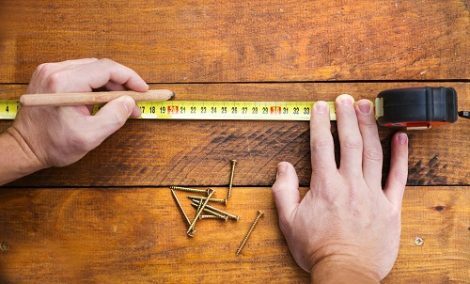 When deciding to hire a general contractor, ensure that you check their licenses and do some research on past complaints and litigation history with the Better Business Bureau and local court clerks. In a civil court of law, you must be able to prove that a legally binding agreement was broken causing you or your finances harm. The best possible way to show precisely the scope of your agreement and how much money you are owed is to have an initial contract signed and notarized before any work begins. Elements of a general contractor’s contract should include detailed progress payments, down payment amount, deadlines, and materials required. It is not uncommon for contractors to require a down payment before commencing work. Contractors often use this money as a show of good faith but also utilize the money to purchase materials for your job. Always avoid paying more than half of the total amount before any work is completed. Any contractor that asks for more may be already experiencing debt or financial issues. Work with the contractor to negotiate a small down payment with progress payments to be paid for certain milestones along the way. What Happens if Your Contractor Files Bankruptcy? Individuals who pay a contractor to perform work who then subsequently files bankruptcy before the work is completed, unfortunately, do not have many options other than to wait on the bankruptcy court proceedings. Debt in a Chapter 7 bankruptcy case is categorized into priority debt (such as payroll taxes and family and spousal support), secured debt (such as mortgage, work truck loans, and equipment loans), and unsecured debt (such as money owed to vendors or customers). The money is paid back to creditors in this order, and because any down payment money paid to a contractor is considered unsecured, you will be at the back of the line for repayment. Additionally frustrating, is that unsecured creditors are only paid back if there is money left over from paying priority and secured debts and therefore, these creditors may only receive a fraction of the money owed if anything at all. Houston bankruptcy attorneys help individuals who are filing for bankruptcy and also help creditors navigate the bankruptcy process as well. If a general contractor has taken money from you with the promise of construction work to be completed, who then files bankruptcy, contact a bankruptcy lawyer to find out what you should do. A bankruptcy specialist can help you navigate motions to object to discharge and what to do if you believe you are the victim of fraud in a bankruptcy case.